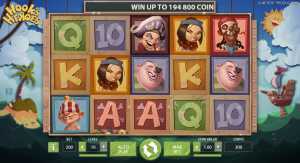 We have to admit that in our opinion, the Netent developers have made a little bit weird online slot machine at first sight. Because the Hook's Heroes slot machine was born with 5 reels, 3 lines and 20 win lines thanks to them. We don't mean it's not a good slot machine but this needs some time to understand what's everything worth. First of all we'd like to make that particular features clear for you on the slot machine. These will be activated when 2 SCATTERS appear on any reels. It's important to know that if we can land 3 or more, we'll win free spins with optional features. However, if we land 2, we'll win only 1 spin with a randomly chosen feature thanks to the FEATURE free spins. In case of the FAIRY FEATURE, the appearance of 2-5 Wilds help you achieving higher winnings. It's obvious that like on other slot machines, Wild symbols can substitute all symbols except SCATTERS. In case of the MERMAID FEATURE, our winnings will be multiplied by 2 generally except when at least 4 Wilds appear on the reels. In case of this, the multiplier will be doubled to 4. This is not a secret that in particular cases it can be a huge surprise to anybody. The PIRATE FEATURE is more special because the symbols are valuable even if they are not next to each other. So it's enough when 3 identical symbols appear on any reels and then we get a prize. It's a known fact that we can get higher winnings easily by this. After we have explained what are the features worth, everyone can decide which to choose during free spins. All of them can be the lucky one but choose wisely. We like the PIRATE FEATURE the most because the symbols don't have to be next to each other.